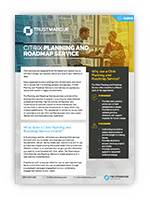 Citrix enables business mobility through the secure delivery of apps and data to any device on any network. To achieve this, Citrix works to build the best integrated technology services for the secure delivery of applications and data, to allow organisations to work quickly, productively, collaboratively, and – most importantly – securely. Citrix services are designed to be the fastest and easiest way to centrally manage and securely deliver any type of app, desktop or data. They eliminate the need to design and deploy management infrastructure, replacing it with simpler cloud based management services. 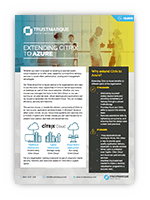 We work with Citrix to deliver world-class desktop and application virtualisation and cloud adoption technologies that allow IT departments to move quicker and focus on what they know best – managing users, desktops and apps deployed at their on-premises infrastructure, or preferred public clouds – and leverage the power of centralised management and the cloud to lower IT costs. Our specialist Citrix certified professionals have an in-depth understanding of Citrix technologies to recommend, support and deploy the right Citrix solutions for your environment that best meets organisational needs while lowering costs, improving security and minimising risk. 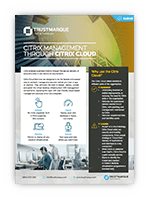 As a Citrix Gold Solutions Advisor, Trustmarque has consistently demonstrated a high level of expertise and experience in delivering Citrix technologies of the highest standard to our customers.